The simplest way to train a model using several machines in a distributed setup. 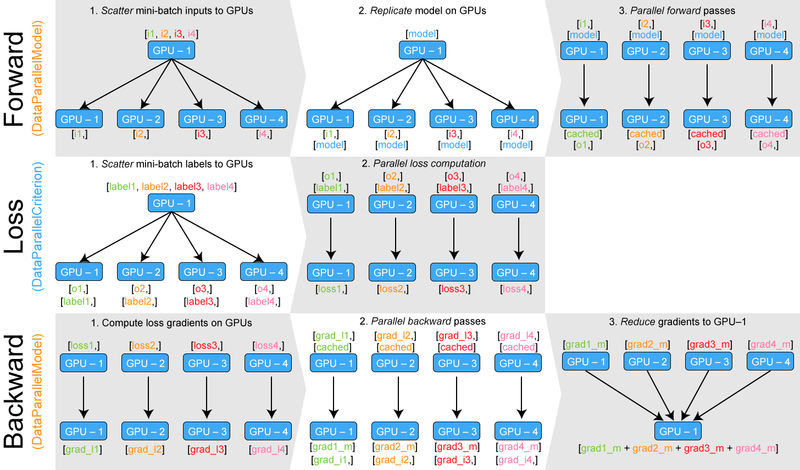 Grzegorz Chlebus made a nice post describing how to do gradient accumulation in TensorFlow, check it out here. computing the loss in a parallel fashion. The first option is the easiest but sometimes you can’t use it or it’s not practical for various reasons (e.g. your forward pass becomes too complicated and slow because of Python’s GIL) so let’s talk a bit about the second solution. Along the road we’ll learn interesting things about how PyTorch multi-GPU modules work. In that case, the solution is to keep each partial output on its GPU instead of gathering all of them to GPU-1. We well need to distribute our loss criterion computation as well to be able to compute and back propagate our loss.